Welcome to Remedex Medical's comprenhensive database of pharmaceutical products and more. Delivering Urgent Medicines Difficult To Find In Your Country. Since 1986 we’ve been exporting American and European medicines to pharmacies, doctors, clinics, hospitals and government agencies around the world. We have redesigned our industry-leading database of products to bring you the most powerful product search yet. The new system offers a simplified interface and workflow. Find pharmaceuticals by name, ingredient, manufacturer, NDC or UPC numbers. 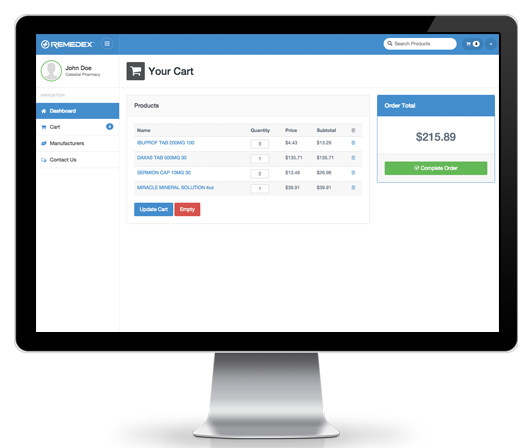 Add the desired products to the cart, and send them to us in order to receive a price quote and availability. It couldn’t be easier! Comprehensive list of 50,000 products. Easy product picking for quoting and purchasing. New to Remedex? Create a new account and experience our service.